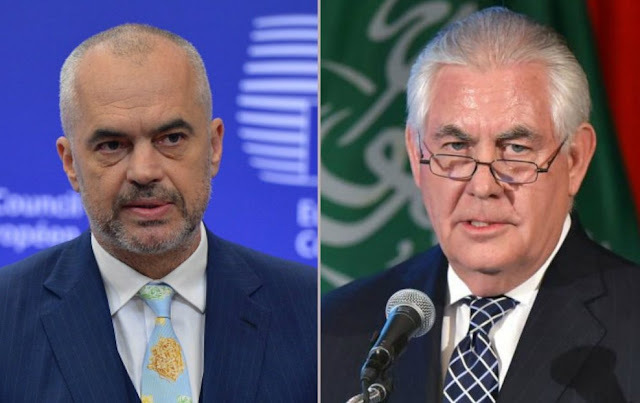 Prime Minister Edi Rama received today a call from Secretary of State Rex Tillerson, the prime minister's press office announced. According to it, Secretary Tillerson congratulated the Prime Minister on the meaningful victory in the last Albanian elections. He has expressed conviction that the strong mandate he has taken to rule alone obliges the Socialist Party to deepen the pace of reforms, to clean up the administration from the corrupt and to score significant results in the fight against crime. By expressing to the Prime Minister all the support of the US government in the new governing mandate, the Secretary of State has conveyed to Edi Rama the very positive impressions of Vice President Pence from last week's meeting in Montenegro and reaffirmed the American will relating to a concentrated focus on developments in the region, According to Albanian State Television. Prime Minister Rama thanked the interlocutor for the call and gave a full picture of the regional situation from the perspective of our country, focusing mainly on the dialogue between Kosovo and Serbia and the need to unlock the stalemate of Macedonia. In the last part, the conversation extended to the role of Albania in NATO, its contribution to the fight against violent extremism, where Secretary Tillerson has expressed the highest considerations. While Prime Minister Rama has asked for intensification of cooperation with the US in the energy sector and especially in oil and gas, and that is expected with much interest from the interlocutor.